The pomegranate vinaigrette was made by combining POM Pomegranate Juice Concentrate, olive oil, champagne vinegar, and salt and pepper. 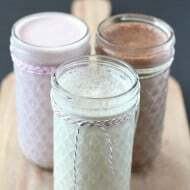 The pomegranate juice concentrate brings a nice fruity flavor to the vinaigrette that works wonderfully with the sweet strawberries in the salad. Wash and dry spinach and put in large bowl. 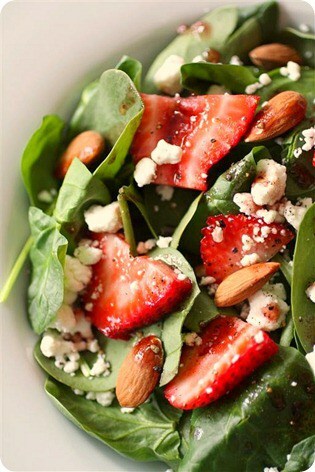 Add strawberries, almonds and goat cheese. Add pomegranate vinaigrette and toss. Whisk ingredients together and pour over salad. 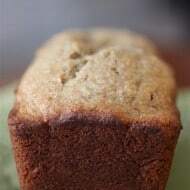 Can also be stored in the refrigerator until ready to be used. mmm I love strawberry salads! They always look and taste so special! I was actually telling my MIL about your stuffed strawberries at dinner last night! I’ve made a similar salad but with different dressing. I agree, salad can be drool worthy! Yours looks great. What a lovely summery salad – and pomegranate vinaigrette sounds like da bomb! I love fruit in salads and this looks so perfect for a hot summer day when I don’t want to cook! 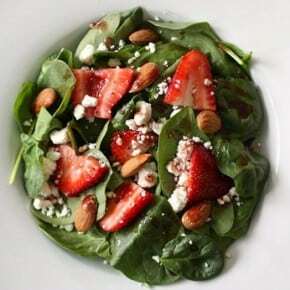 Spinach, strawberries and goat cheese are a perfect combination! And the pomegranate vinaigrette is just the icing on the cake…err…salad. Can you believe I don’t like goat cheese? Please don’t hate me 😉 The salad still looks perfect. I love strawberries and spinach together. Instead of goat cheese and if you like blue cheese, it goes well with everything on this salad. I’d say it’s drool-worthy for sure! I love the poppin’ colors–so pretty! Yum! I’m not usually a big fan of salad (as a general rule), but this one looks delicious! Yum! 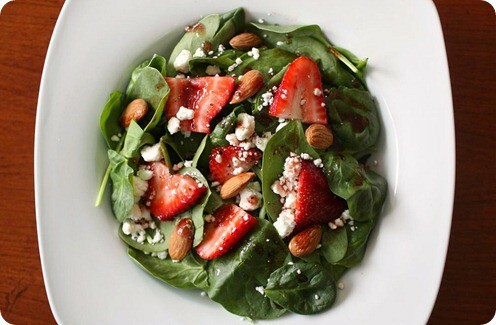 I love spinach/strawberry salad. Love your POM viniagrette. What a pretty summer salad – I love the pomegranate vinaigrette…haven’t see pomegranate juice concentrate yet, but I’ll be on the lookout! It’s not even breakfast yet, but I wish I was eating this. That sounds like a wonderful vinaigrette! This is exactly the kind of salad I like to eat during the summer. I love salads like this for summertime. It seems that we eat quite late when its nicer weather out and this kind of thing is really just what you need and nothing more! Another gorgeous salad! I can’t wait for strawberry season so I can make this! 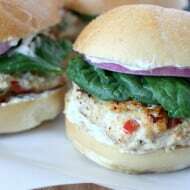 Thanks for linking up at my salad blog hop!